Sean Brain netted twice for the Bees on Saturday. Picture by Marcus Mingins. JOHN Edwards says Studley must learn some tough lessons from their defeat at title-chasing Racing Club Warwick to take into their final five games of the season and into next term. Joint-bosses Edwards and Wayne Bunn felt the Bees paid for their naivety in losing 4-2 at the Racers last weekend, conceding vital goals from set-pieces and at key times in the game. 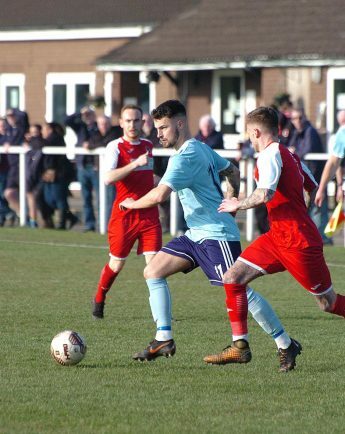 Edwards will demand a positive response when Brocton, who sit one place and three points behind eight-placed Studley, visit the Beehive for Saturday’s Midland League Division One contest. “I can’t blame the effort, but we were a little bit naive,” said Edwards. “They are a good side but we didn’t help ourselves by conceding after two minutes, then a minute before half-time and again five minutes into the second half. “It was 3-1 at half-time and the next goal was always going to be crucial, which was the message at half-time. But we conceded straight away and, although we were the better side for the rest of the half, the damage had been done. We did have our chances but we need to make the opposition work harder for their goals. Injuries have not helped Studley’s quest for consistency all season and they were forced into changes when, having already been without the suspended Simon Fitter, Joe Adams and Steve Roche, Matthew Edwards limped out with a torn hamstring and recent signing Connor Doyle failed to show up. Edwards also admitted they got the tactics wrong, with a three-man back line struggling to restrict second-placed Warwick who have netted 99 goals in their league campaign. Joe Smith headed home a corner for the Racers’ opener on two minutes but Studley levelled on 13 minutes when Sean Brain fired home. Two goals from Ben Mackey pushed Warwick 3-1 ahead at the break and Danny Bartle converted Mackey’s cross for 4-1 before Brain raced clear for his second on 67 minutes. “I’ve watched Warwick and they play with one up front so we changed our system, but it didn’t really work,” he said. “Having said that, we could have played six at the back and it wouldn’t have made a difference when you let attackers get free headers from set-pieces. The Bees will have experienced former Bromsgrove and Evesham defender Fitter plus midfielder Adams available to face Brocton after their bans, but Roche remains absent. Anthony Miller comes into contention after his injury, having featured as a substitute.